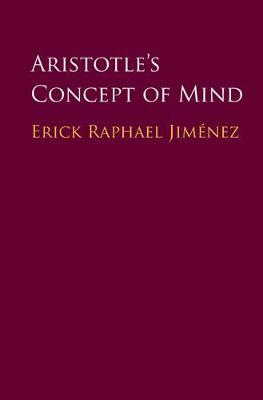 In this book, Erick Raphael Jiménez examines Aristotle's concept of mind (nous), a key concept in Aristotelian psychology, metaphysics, and epistemology. Drawing on a close analysis of De Anima, Jiménez argues that mind is neither disembodied nor innate, as has commonly been held, but an embodied ability that emerges from learning and discovery. Looking to Aristotle's metaphysics and epistemology, Jiménez argues that just as Aristotelian mind is not innate, intelligibility is not an innate feature of the objects of Aristotelian mind, but an outcome of certain mental constructions that make those objects intelligible. Conversely, it is through these same mental constructions that thinkers become intelligent, or come to possess minds. Connecting this account to Aristotle's metaphysics and epistemology, Jiménez shows how this concept of mind fits within Aristotle's wider philosophy. His bold interpretation will interest a wide range of readers in ancient and later philosophy.